This page features information on our special spring seminar being held in Burlington, Ontario on March 28, 2013. If you would like to be a sponsor of the seminar please contact the speaker organizers for the Hamilton Niagara chapter. 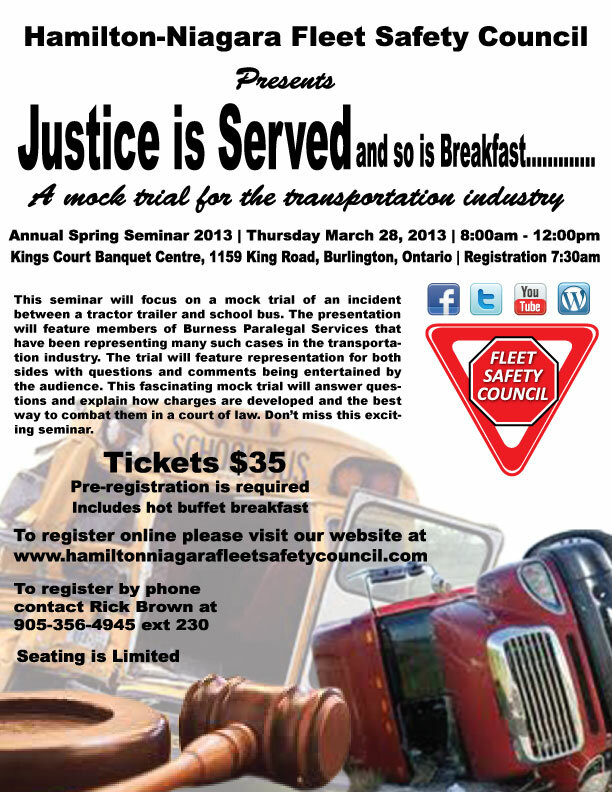 The Spring Seminar is one of the biggest seminar meetings held by the Hamilton Niagara Chapter. This year we are holding a mock trial featuring the team at Burness Paralegal Services. The mock trial will be based on an actual case involving a school bus and transport truck. The trail will follow the flow of an actual courtroom with the added involvement from those seated in the audience by asking questions and comments. Host Mike Derry will be the liaison between trial participants and the audience. This mock trial will explain how charges are laid and how best to combat them. Don’t miss this exciting event. Mock trial was a great success. If you missed it you can view video highlights on our Youtube channel. Here is the first of 4 parts for your viewing pleasure.